Worried, then relieved. There was a valid early-bloom Breakout on Candle 04:00. Typically, I would trade it at the Candle 08:00’s Close. But then I also noticed that Candle 08:00 was an on-time Breakout Candle, but with one problem: its Anchor-SL range was only $0.87; so, not a valid signal. Which one did I have to refer to? The early-bloom one of course! However, even if that Candle 08:00 was a valid one, I would still trade the earlier. Why? I would prioritize on Risk Management. It has more room for Price to wiggle. Hence, it’ll avoid my Trade getting stopped out while in red. 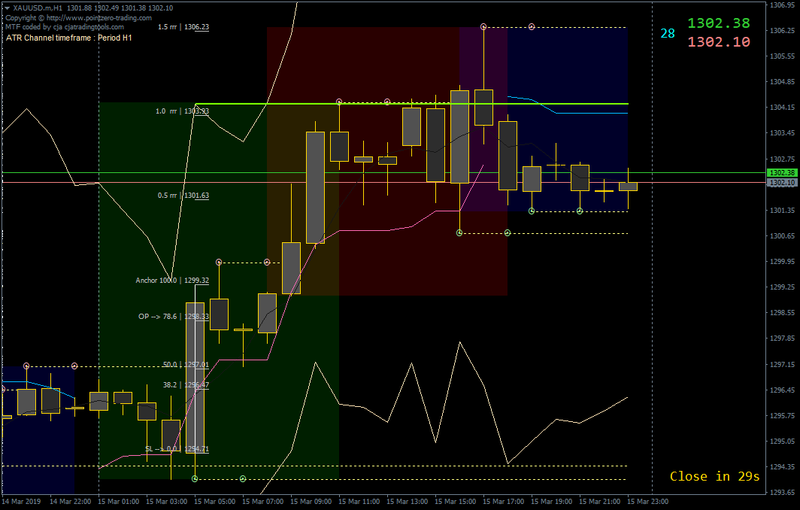 The SL was at Candle 04:00’s Open, and the Anchor was at Candle 08:00’s High + Spread. OP was triggered not long after. But Price pulled back down and even created an upper Chandelier. Thankfully, Price started to climb higher though struggling. Candle almost touched TP at Candle 15:00, and started to pull back down again. Getting a little worried that Price hadn’t pushed through above 0.5 rrr till this late hour. 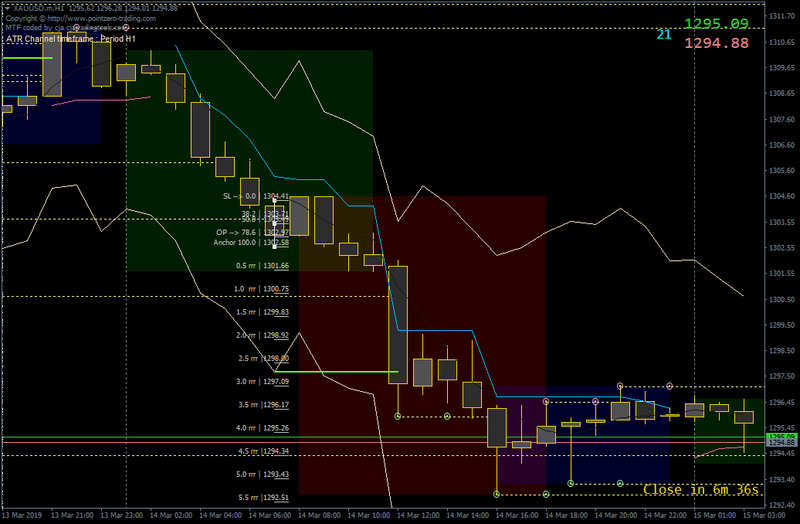 Decided to sleep anyway, and said to myself, “Que sera sera.” while hoping I could gain a few pips before end of day. Woke up near the end of Candle 23:00, and saw price closed above TP on Candle 21:00. I immediately closed the Trade with a decent 1.0 rrr win. 1. This Trade had the opposite composition than the March 8th Trade in which its early bloom was the invalid one. Either way, the call to action for both is to trade with the valid one. 2. This Trade’s Price Progression was mentally tiring and with less than expected end result. Hopefully, it’s not a typical Price Action for such Setups Combination. Hmmm… This Trade was the 2nd time this week I saw the Trail Stop got hit by Price before moving up above TP. But now, the Trade’s Close was at about the level that was mandated by the Rulebook. So, back to my March 11th Question, do I need to replace the Chandelier Stop with the rrr-based Stop? Yes. The Chandelier is good when price movement is sailing up nicely, which what happened in the last two months or so. However, a good trailing stop method must also provide enough room for when the volatility is rather erratic like what happened recently. The rrr-based method is able to provide that. It will be applied starting next week. Chandelier trailing stop was still used in this trade. The Trade started with an early-bloom Breakout on Candle 03:00. Candle 08:00 formed as a bearish candle, so I waited. Next Candle formed as a bullish one; that was my cue to enter the trade. In less than an hour OP was triggered, followed up by a strong North Push before got halted below 1.0 rrr area. The Chandelier Stop was triggered on Candle 15:00, resulting in I secured another 0.5 rrr win. After ranging for 5 hours, it spiked up crossing above TP on Candle 21:00. And finally closed the day near 1.0 rrr level. 1. It seems early-bloom Breakouts tend to be followed up by erratic Price Dynamics. 2. Trailing Stop management hence need to anticipate it. I’m preparing to replace the Chandelier method with the rrr-based one for that purpose. Hesitated at first. We’ve seen plenty of breakouts in recent trades. This one’s caught me by surprise. Firstly, there were 2 Breakouts this day; Candle 05:00 and 07:00. Rulebook instructed to see only the last one. So I did. But, because Candle 07:00 was an early-bloom one, I had to wait. Candle 08:00 turned to an unexpectedly Bullish Candle. Then, Candle 09:00 formed a bearish again. What supposed to be my Sell Signal stunted me for a while. Its position is practically on the same level as Candle 07:00. I’ve never seen this before. But I thought, this thing was still workable. I checked other criteria; they all gave go signs. So, I forced myself to stop my habitual thinking about what to expect in this kind of setup, and actually opened the trade. The Anchor-SL arrangement of this unconventional setup still used the usual policy for the early-bloom breakout. SL was at Candle 07:00’s Open + spread. Anchor was at Candle 09:00’s Low. OP got triggered on the next Candle. And another surprise occurred. Price hit TP on Candle 12:00, the 2nd TBeC in this Trade. That meant more downward push could still come. I’ve decided to use the rrr-based method in this trade. Candle 12:00 was in 2.5 – 3.0 rrr area, so I waited another candle to decide where to put my trail stop. Turned out it closed in 2.0 – 2.5 rrr area, so I moved the SL to 1.0 rrr level. Price move down again in next candle to 3.0 – 3.5 rrr area; a first entry to a new area that also formed as the 3rd TBeC; this meant I had to wait for another candle to determine a new SL. Until Candle 16:00 formed as the 4th TBeC and a rejection Candle against a Lower Fractal Level. It was time for me to close my trade there. 1. It’s right what they say. No trade is ever the same. Day Traders need to be fast interpreters and decision makers facing various nuances of their opportunity setups. If it’s not our natural talent to be so, hopefully lots of practices would make us so. Oh, well… Occasionally, we see OPs don’t get triggered; expected risk of doing pending order. This was one of those days. However, as far as the Price dynamics go, they have been anticipated in the Rulebook; especially with the new rrr-based trailing stop. The Results below assume my OP was triggered to describe the play by play of the Trade. This early-bloom Breakout started on Candle 05:00. Candle 08:00 formed the first bullish Candle in the signal period, which was my signal to open Trade. Next, Price moved strongly up to 0.5 – 1.0 rrr area creating 2 TBuCs already, but it got halted around TP zone. The next Candle touched and pulled back down. Since it’s only 2 TBuCs showed up, I won’t close the Trade just yet. 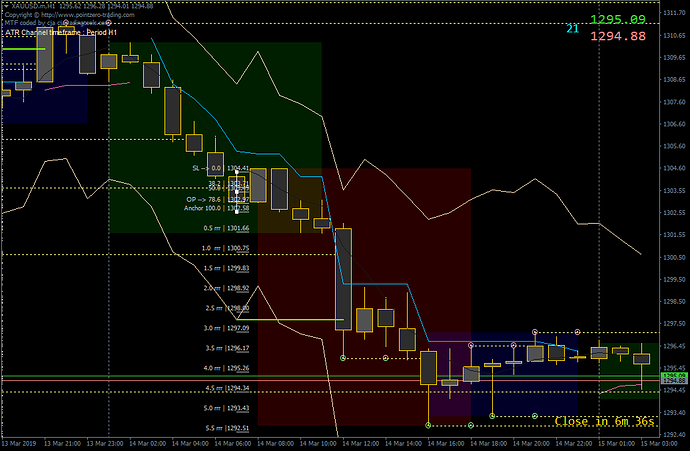 On the other hand, it was also time to move SL to Level 50.0 since two Candles were already staying in 0.5 – 1.0 rrr area. Price moved around that zone since then. 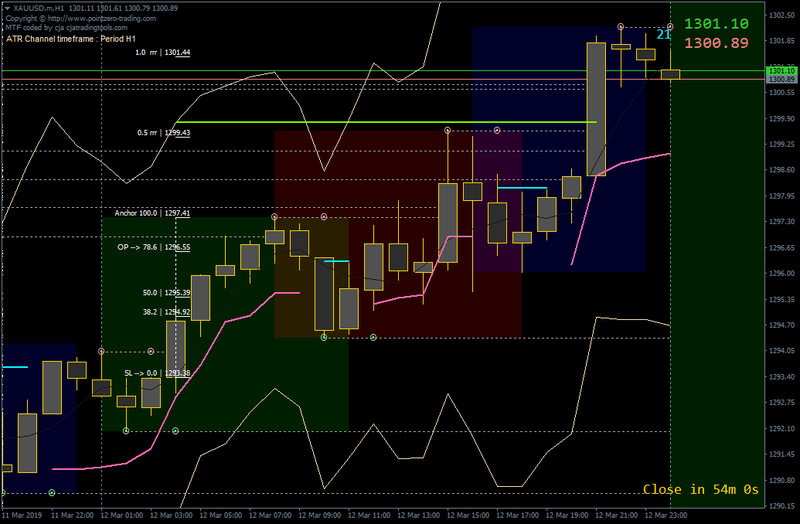 Candle 14:00 touched TP again, but closed below it; creating the 3rd TBuC. I would’ve closed the Trade here immediately after the Candle closed. Later on, Price moved down and up and down again. before started residing gradually until end of day, and closed slightly above 0.5 rrr level. 1. Reminder to myself that OP not triggered is part of the game. Specifically, part of the risk of pending order policy. 2. This was rather a smooth-sailing Trade. Hence, the new rrr-based Trailing Stop wasn’t much needed, unlike in previous day’s Trade. But that’s the point. Better be flexible than less profits, right? 3. The TP policy also worked well in this trade. I have some ideas to combine it with the rrr-based trailing stop. But decided not to undergo it. It’ll just complicate things unnecessarily. Surprised. This was the 1st Loss at SL Level in this journal. As per current Criteria, all checkpoints were checked. Looking at Price Dynamics, the only possible new criteria to add to is that the lower long-legged Doji in Candle 04:00 shouldn’t be there to make this early-bloom, bearish Breakout a valid Sell Trade. There were other forms of reversal Candles before, such as Candle 06:00 in last Friday’s Trade. But, I’ve never seen them as early indicators for full-throttled Reversal like this day’s trade has shown. An early-bloom, downward Breakout happened on Candle 02:00. Candle 08:00 formed a solid bearish Candle; my signal to open a Sell trade. One Candle later, Price immediately hit the SL Level. 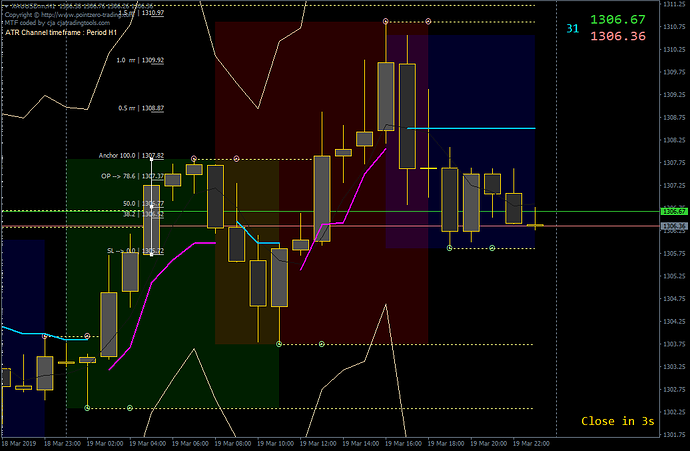 As mentioned above, the bullish long-legged Doji on Candle 04:00 should’ve invalidated this Trade. The Reversal on Candle 09:00 created another Breakout opportunity—to buy this time—but its Anchor-SL was too wide. 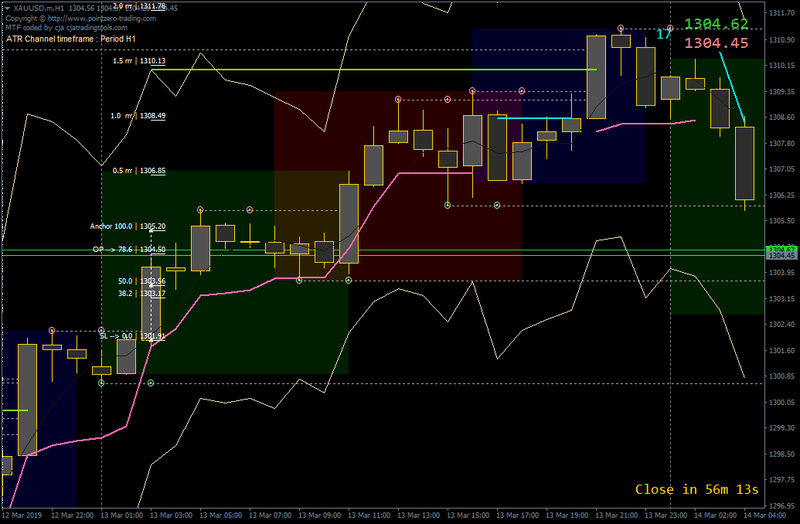 The width indicated the follow-up bullish Move might not be strong enough to trade. And, it was in fact the case as later on Price only wobbling around its Anchor – 0.5 rrr area, before ending the day between OP and Anchor. 1. Both wins and losses should be used to our advantages as sources of learning the Market Behaviors, and improving the Trading Plan. 2. Will be adding the long-legged Doji screening for future early-bloom, breakout Trades. Grateful. Two early-bloom breakouts, but the last one invalidated itself so I decided not to trade it. Price went zigzag after. So, it was the right decision not to trade it. Early-bloom bullish Breakouts occurred on Candle 03:00 and 05:00; so, I’d looked only on the last one. Entering signal period, Candle 08:00 turned very bearish. I was hoping it would reverse back in the next Candle. But that didn’t happen. 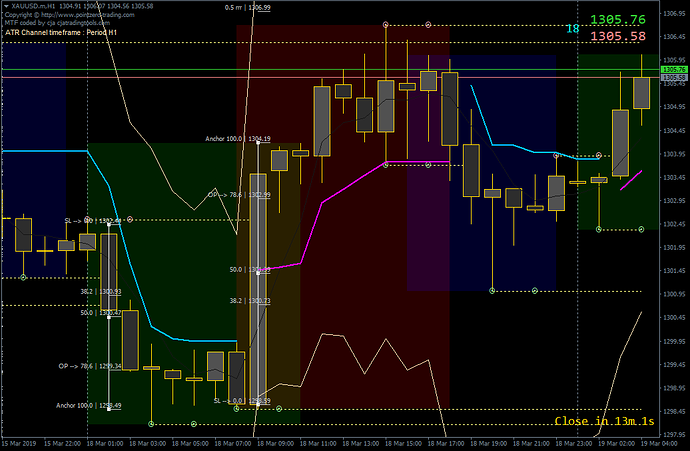 It and the next one even closed below the designated SL Level. Reversal finally happened on Candle 11:00—still in signal period. But the setup looked unworkable with the current policy. The designated SL was practically at the same level as the designated Anchor. So, this one is not tradable by the typical setup of an early-bloom Breakout. Price did move up quite steadily after, but halted by resistance around $1311 area. It got pulled back down strongly on Candle 17:00, and gradually residing after that and closed still in net bullish at end of the day. Looking behind few days before, there was a resistance zone around Anchor – 1.5 rrr area. So, it’s to be expected seeing rather funny Move like this. 1. The Criteria has saved me from taking a bad trade this day. Psychologically, that helps in boosting my confidence in the Rulebook. 2. The Congruency between what the Rulebook advises based on H1 Price Dynamics versus higher time’s dynamics strengthens my hypothesis once again that we don’t need to look for higher timeframe setup to make trade decision. The Trade’s own Timeframe ought to tell us that. We just need to know how to read and make action plan based on it. Please be informed that I will no longer update this Thread due to a technical Limitation that BP platform has. I’ve created a new thread just to address this concern. Eventually, there was a work-around that both I and Admin as well as few other high-ranking members could agree on. But my last query about names of Moderators who would be available was not answered for days, even until this post is uploaded. The agreed work-around requires Moderators to promptly response to OP’s queries. What if a prolonged Response–or no Response at all such as that last one–happens when I need a fast follow-up in the future? Hence, this decision to discontinue my Journaling Thread … here at BP. I have migrated the old posts to another Forum Website. I’ll continue my journaling there. So sad that it has to end like this so soon. As mentioned, I’ve tried to find a solution. But just like trading in the market, I don’t have full control over it. I wish you all the bests in your trading journeys. And thank you for everything.